Shiny Combee in game: 37 Who? Important notice! 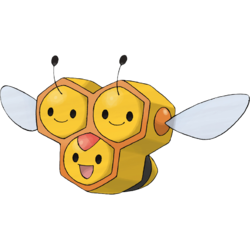 Pokemon Shiny Combee is a fictional character of humans. Combee (Japanese: ??? 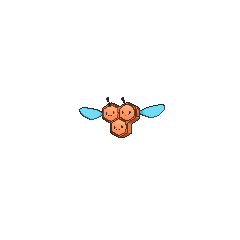 ?— Mitsuhoney) is a dual-type Bug/Flying Pokémon introduced in Generation IV. Combee can fly with its two wings as long as the top two "bees" co-ordinate their flapping. It is mostly sociable among their own kind. It is generally harmless; it flees when threatened. A Combee will almost always be found collecting honey wherever they can. The gathered honey has multiple purposes, though it's usually consumed. When it is not gathering honey, it sleeps or protects its queen. The former is done by building a hive along with other Combee, locking together into a "wall" to feel safe in larger numbers. It is very suggestible and will never defy the orders of its queen. When a Vespiquen feels threatened, its subject Combee will not think twice about risking its life to protect the queen, then attacking and even killing the threat in an aggressive manner. It commonly lives in caves and hollow trees of forests and other natural, secluded areas with their queen. Combee made an appearance in An Angry Combeenation!. 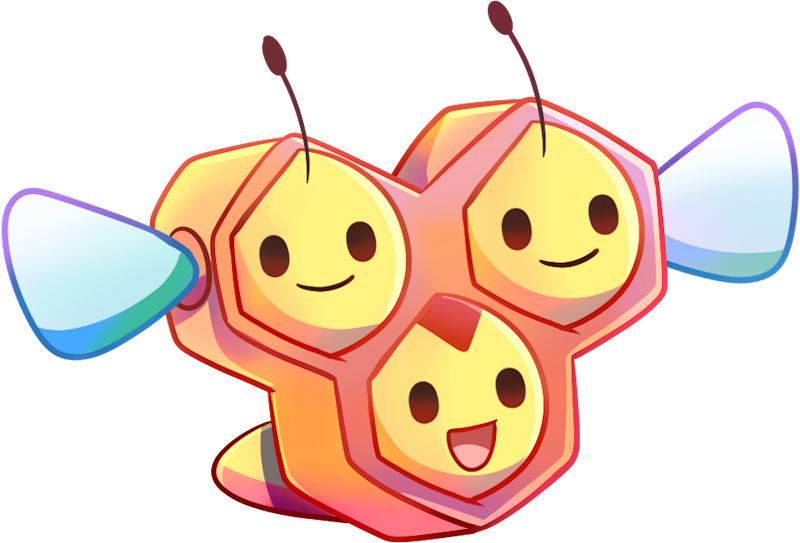 Multiple Combee appeared in Danger, Sweet as Honey!. Several Combee made minor appearances living in the gardens of Alamos Town in The Rise of Darkrai. 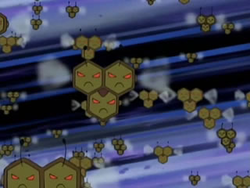 Three Combee appeared in a forest at the beginning of Giratina and the Sky Warrior. Combee also appeared living in Michina Town in Arceus and the Jewel of Life. 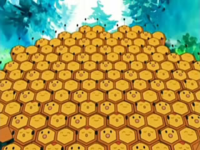 A group of Combee appeared in Historical Mystery Tour!. A photograph of multiple Combee appeared in The Four Seasons of Sawsbuck!. A Combee appeared on the picture in the gallery museum in A Blustery Santalune Gym Battle!. A Combee appeared as a plush toy in A Jolting Switcheroo!. 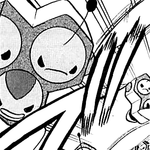 Two Combee appeared in a flashback at Professor Sycamore's lab in Mega Evolution Special I and Garchomp's Mega Bond!. A Trainer's Combee appeared in A Relay in the Sky! participating in the Pokémon Sky Relay. A girl who was the daughter of the Valley Windworks manager ordered her multiple Combee to attack Diamond, Pearl, and Platinum when Diamond licked the Honey off of the trees that was slathered for her Combee. Mitsuhoney may be a combination of ?? mitsubachi (honey bee), ?? mittsu (three, referring to its anatomy), and honey. Mandarin Chinese ??? San Mì Feng Literally "Three honeybees".